, and they describe the type of content they contain. For example, to indicate the beginning and end of a paragraph, the content is wrapped using a “p” tag: <p>The paragraph goes here.</p>. 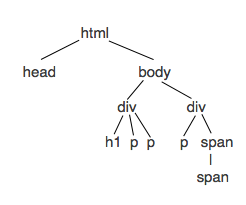 W3 School has a great in-depth article here covering HTML tags. 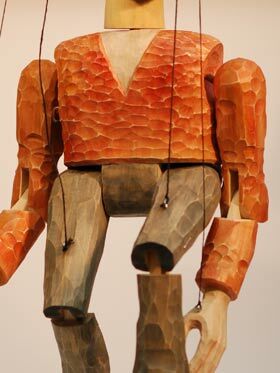 To illustrate this point, imagine a string puppet for a minute. 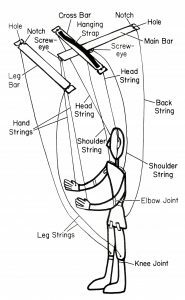 If you think of a web page as a puppet, then the DOM could be thought of as the strings and the points at which they attach to the puppet. The DOM is made up of elements that are connected in a tree-like structure. The elements of this tree are objects, and they can be accessed from the root document object mentioned in the previous paragraph. Before we can manipulate a section of the DOM, we first need to know how to select an element. To help with this, I’ve made a very simple web page that you can experiment with: http://matw.me/example.html. Open this page in a new tab and follow along. As you can see, it’s a fairly simple page. 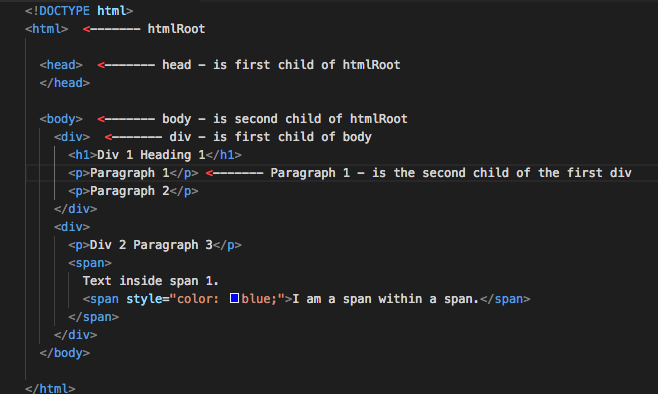 There is an inline style to color the nested span blue, but not much else is going on. First off, let’s change the text of the first paragraph. Before we can manipulate the first paragraph, we have to select it. There are many ways to select an element on a page—you can get elements by class name, id, tag name, or by “walking” up and down the DOM tree. Since the “document” is the DOM root, everything on the web page is a child of the document. 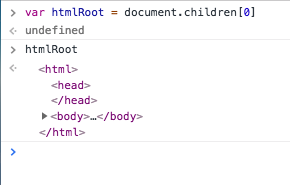 As you can see in the tree above, “html” has two children: “body” and “head.” If we want to navigate to the first paragraph, we have to go through the “body” and then the first “div.” The first paragraph will then be the second child. We already know we want the body, which is the second child. Since our index starts at 0, htmlRoot.children would refer to the head, and htmlRoot.children would refer to the body. Let’s save the body as a new variable. We can do that with var body = htmlRoot.children, and pressing enter. All the code entered to get here is recapped at the bottom of the page. As you can see, we finally have our paragraph saved as a variable! Now we can manipulate the text, style, class, id, or other attributes of our “p” element. 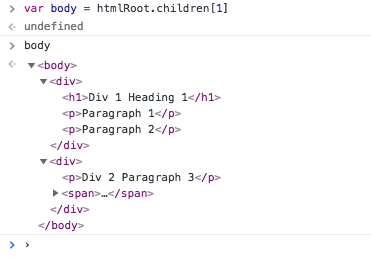 This style of selecting an HTML element by going up or down the tree using children or parent selectors is called “walking the DOM.” There are other ways to select elements on a page, but I will cover these in future posts. Let’s update the text in our first paragraph to say “Hello World.” Even though navigating the DOM and selecting the first paragraph was somewhat complicated, changing the text itself is very easy. The paragraph element, which is of course an object, has a property “innerText.” If we type firstParagraph.innerText, we will see the current text of the element returned. We can simply set this innerText to our new value and it will update the page. Instantly, our text gets updated to “Hello World”. There are lots of methods that can be used to select elements from the DOM, and while many of them would have made selecting this element easier, in my opinion it is very important to learn how to navigate the DOM using a simple straight “walk down” as demonstrated here. Learning this method helps provide an understanding of what the DOM is and how it is structured. In my next post, I plan to go over other “document” methods that will make navigating and manipulating the DOM simpler and faster. In the meantime, play around with selecting DOM elements and updating them. Share some screenshots in the comments section.